In this tutorial, we'll see how to start a new animated cursor project from a static image. 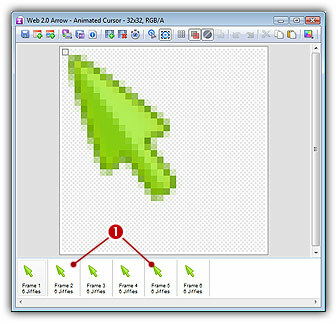 All the frames of the animated cursor will be initialized with the same image. Then, you'll be able to edit the frames in order to create the animation. 2. For example, open the file located in the librarian: "Cursors\Tutorials\Web 2.0 Arrow.png". The image file opens in a document window. Axialis CursorWorkshop will convert images to 32 bpp with transparency when possible, which is much more convenient to create cursors. The following image formats can include transparency: Photoshop® PSD, PNG, RGB, GIF, JPEG 2000 and WMF. 6. 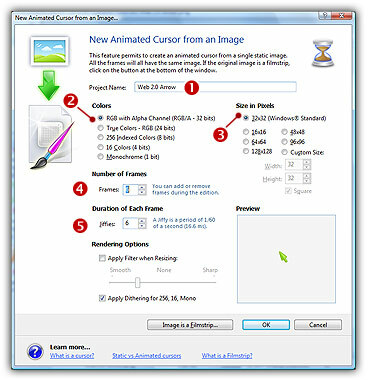 The dialog box New Animated Cursor From Image opens (see below). In the Project Name group ( ), enter the cursor project name. Do not specify any extension. 7. In Colors ( ) and Size ( ) groups, select the format of the animated cursor. To read more about the cursor specifications see What is a cursor topic. 8. In Number of Frames ( ), enter the initial number of frames of the animated cursor. 9. In Duration of Each Frame ( ), specify the display time of each frame in Jiffies (1/60 sec). For example, 6 Jiffies = 0.1 sec. 10. You can also apply a smooth/sharp filter to the final images. 12. Now you can modify the different frames to add animations, objects or effects.